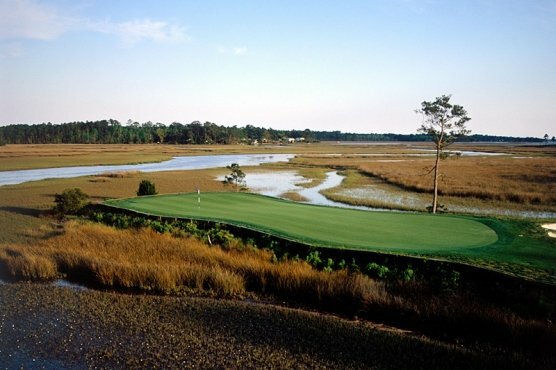 PAWLEYS ISLAND, SC – In 1997 the local newspaper, The Sun News, published The 100 Greatest Golf Holes Along the Grand Strand. River Club holes No. 14 and 18 were included. More than 15-years later there is no reason to think things have changed. No. 14 seems innocent enough at only 149-yards from the White Tees and a Handicap of 16. However, it’s all carry over water and sand bunkers that protect the front of a wide, narrow green. Club selection is critical on this very pretty golf hole. A back left Sunday pin position makes it almost impossible to go for the stick. Three putts are always lurking on this masterpiece. One of the best finishing holes on the Grand Strand No. 18 is all about risk-reward. A well-struck drive from any tee can put you just 140-160 yards from the center of the green. Of course off target left or short and you’re wet, while giant fairway bunkers wait to capture errant fades. Even with that picture drive, water and very large sand traps protect a big green. Playing safe on this Par 5 can still put you in birdie position to close out a match. With 9-holes being doglegs, the risk-reward opportunity is in play on more than half the Par 4s and 5s. With water on 15 holes and over 100 sand traps, it’s understandable that this is one of the highest rated courses in the area and a favorite of both locals and visiting golfers. With moderate length at 6677-yards from the Black Tees, players will find generous fairways and sizeable greens with some undulation. On our mid-August play date we found the course to be in very good condition. The fairways were lush, but the rough was high, thick and quite penal. With wide fairways, we should have avoided the rough, but it was one of those days. We were particularly interested in how the course’s new Champions Ultradwarf greens looked. Although vertical cut and sanded a few weeks ago, it was evident the new greens were restoring nicely. Along with the fringe they will be in great shape for early September and beyond golf. It appears the change was good for both the club and the players. The raised clubhouse provides a pleasant view of both Holes 9 and 18 from the snack bar. The pro shop is well stocked with logo merchandise. Although the driving range is limited to hitting into nets, there are very large chipping and putting greens. River Club is truly one of the best of the South end golf courses. A great layout in great condition makes for a memorable round.